However, these distros tend to lack development tools and contain unnecessary packages, such as systemd. WLinux is a new, open source Linux distribution based on Debian stable that has been specially optimized for WSL. 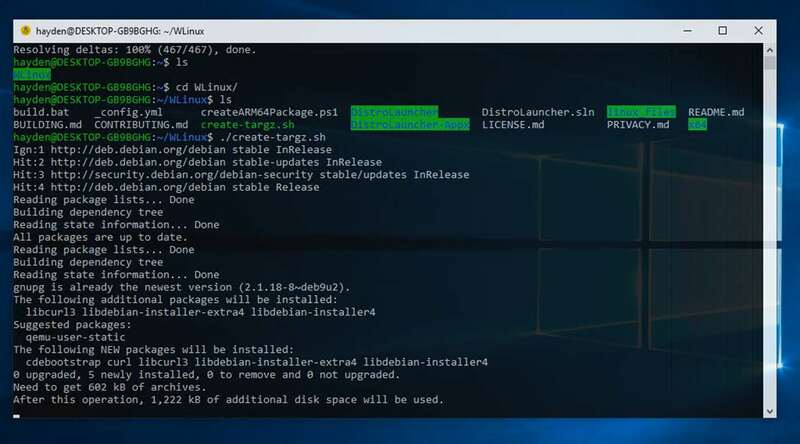 Created by open-source software startup Whitewater Foundry, WLinux has a number of WSL-specific enhancements enabled by default, with additional features planned for the future. A fast Linux terminal and development environment for developers and pro-users built on Windows Subsystem for Linux (WSL) on Windows 10. Popular development tools, including zsh shell, git, neovim, and python 3.7 pre-installed. Additional packages can be easily installed via the apt package management system (e.g. $ sudo apt install nodejs) from the expansive Debian repos and third-party Debian-compatible repos. The Debian backports and testing repos are also pre-configured. Pre-installed with wslu, a set of useful open-source utilities for interacting between WSL and Windows 10. Think another app needs to be here? File a feature request and state your case. There’s an official Wiki here, and WLinux can be downloaded directly from the Microsoft Store. It isn’t free however -- the distro is usually priced at $19.99, but for a limited time you can get it for $9.99. If you don't want to pay, you are free to build WLinux from the source yourself or fork it into your own project.